However, it is possible to gain some idea of the scale and development of the trade by analysis of the factories where the fish were salted and the sauces produced. These have large concrete vats, in which the fish were put alternately with layers of salt, and left for days or weeks to absorb the salt by osmosis. The guts and small fry would be mulched down to create the sauces garum and liquamen, perhaps with other flavourings added. Although they have often attracted more attention in ancient and modern literature, garum and liquamen were in a sense a by-product of a much larger fish-salting industry. 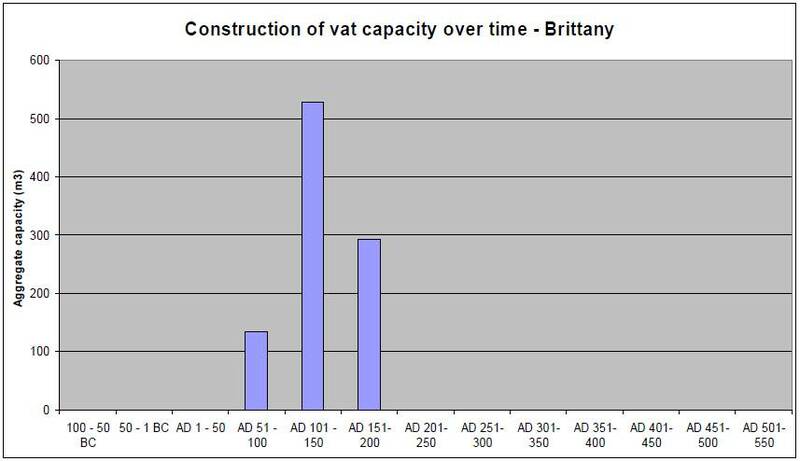 Quantification of the available vat capacity for salting in use at particular periods could allow a general sketch of the growth and shrinkage of the fish-salting industry during the Roman and late Roman periods. The technology of salting vats can be traced back to the 5th c. BC, when small Punic vats are known from the bay of Cadiz. However, the construction of factories with batteries of concrete vats is clearly a Roman phenomenon, reflecting a veritable fish-processing industry (the word, for once, is appropriate) on a far larger scale than the probably largely pithos-based production of the Greek and Punic worlds. The intensity of exploitation suggested by the processing structures is echoed in the reduced size of fish specimens during the Roman period. 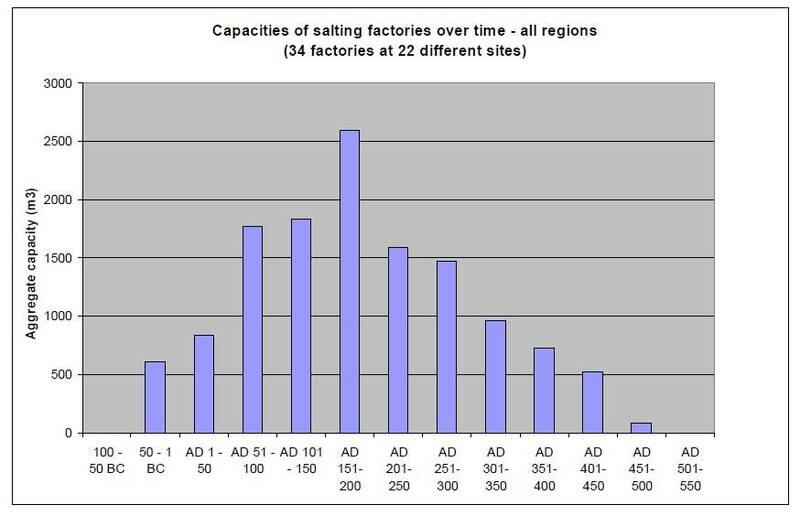 The emergence of built vats and factories is linked to the development of empire-wide Roman markets, and the comparable chronological trajectories of the industry in several different areas of the empire, although nuanced by local factors, suggest that the industry may serve as an empire-wide indicator of economic fortunes. The regional distribution of fish-salting vats. The distribution of salting establishments in the Roman world is very uneven; in the Mediterranean most are concentrated along the approaches to the Straits of Gibraltar, and along the north and east coasts of Tunisia, while those in the Black Sea cluster around the Kimmerian Bosphorus. Much of this patchiness is real, but parts may be attributed to a lack of field research - the concentrations of sites along the Tunisian coastline stop abruptly at the frontiers with Libya and Algeria. This is a result of the difference between the relatively intensive work of the Tunisian coastline survey and the utter lack of systematic prospection in the neighbouring countries. Nevertheless, the location of offshore shallows favourable to various species, and migration routes also played a part. The apparent lack of salting establishments in the Eastern Mediterranean and also in the Adriatic is surprising, and may be due partly to a lack of research. Certainly fish were salted in these areas, both in the Greek and Roman periods, and Dalmatian muria was renowned (Pliny NH 31.94). But perhaps in these regions fish-salting and garum production was done in pithoi or dolia, as attested also in smaller-scale operations in the west (e.g. the so-called 'garum shop' at Pompeii, or the late antique operation in the Maison des Fresques at Tipasa, Algeria). Any such production would necessarily be of a much lesser order of magnitude than in the installations with large built vats known from the western empire and the Black Sea. Little is known about eastern fish amphorae either although they must have existed. One might expect that Lake Mareotis would have provided good fishing grounds and a supply of salt, but as yet no evidence for salting works is known from its shores. The map also shows the importance of an area often overlooked in discussions of fish-salting - the Atlantic coast, and in particular Brittany. The large establishment no. 2 at Plomarc'h, with 10 cement-lined salting vats totalling over 466 m3 capacity (and another 5 unlined vats, of uncertain purpose), is only one of a number of sites known in the area, whose layout and vats resemble generically those of the Straits of Gibraltar. No production of amphorae is known from this region, and while small jars from Plomarc'h may have been for garum, the salted fish from these sites must have been exported in barrels, rendering their transport archaeologically invisible. 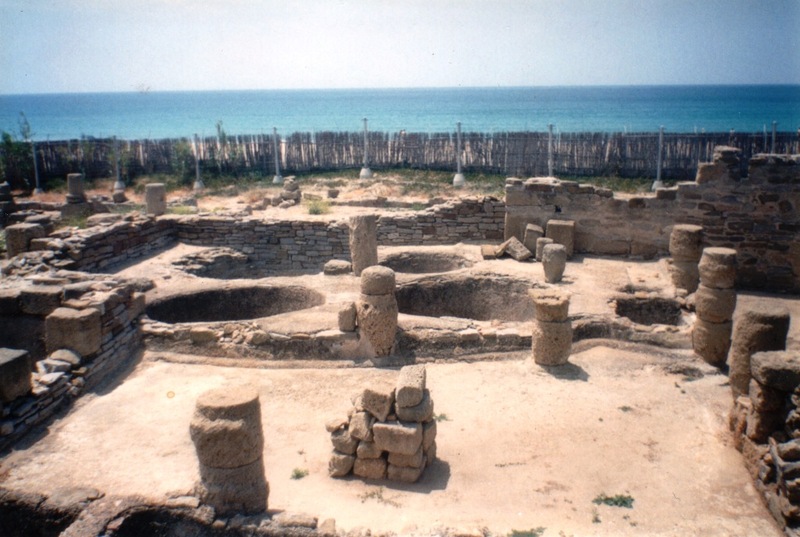 The significance of Armorican salted fish production is therefore only apparent from excavation of the salting factories. This also applies to the Black Sea, where the lack of identified salt-fish amphorae - as currently understood - contrasts with the salting infrastructure of the production sites. 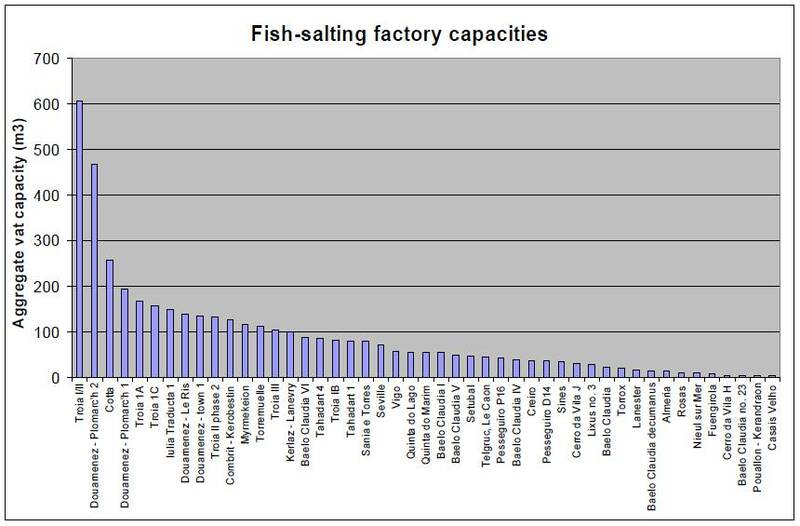 Although the fish salting industry has not been investigated with equal intensity in the eastern and western Mediterranean and the Black Sea, it is unlikely that if large salting factories existed in the Eastern Mediterranean they have been completely overlooked. If one accepts the hypothesis that in the Eastern Mediterranean fish-processing sites may have used dolia as their salting containers, then the difference is chiefly one of scale, rather than of presence or absence of salting. The answer to the question of why the really large salting factories are found in the western Mediterranean, Brittany and the Black Sea, but not in the Eastern Mediterranean probably lies in the fact that the large-scale factories were designed to handle the massive catches of migratory species along particular routes. They are therefore found chiefly on the key migration routes along the Straits of Gibraltar and the North African coast; through the Kimmerian Bosphoros; and in the Bay of Douarnenez (Brittany) where there are migrant shoals of sardines. A slightly different explanation might be given for the general absence of fish-salting establishments along the Italian coast either side of the Tiber estuary, but the presence of numerous fishponds for fish-breeding along the Italian coast - the market for fresh fish at Rome encouraged investment in the intensive fish-breeding in areas close enough to get fish to Rome for fresh sale, while further afield salted fish was produced for the extended pan-Mediterranean market. Although very small installations exist alongside larger ones, factories with capacities of 30 m3 or more are only found in Brittany, Baetica and Lusitania, the North African coast, and the Black Sea, where large migrating shoals of fish could be caught. Smaller establishments, of 3-20 m3 capacity, were to be found along the coasts of Italy, southern Gaul, and Tripolitania. The vast factories at Tróia I/II and Plomarc'h 2 far exceed any other individual establishments. 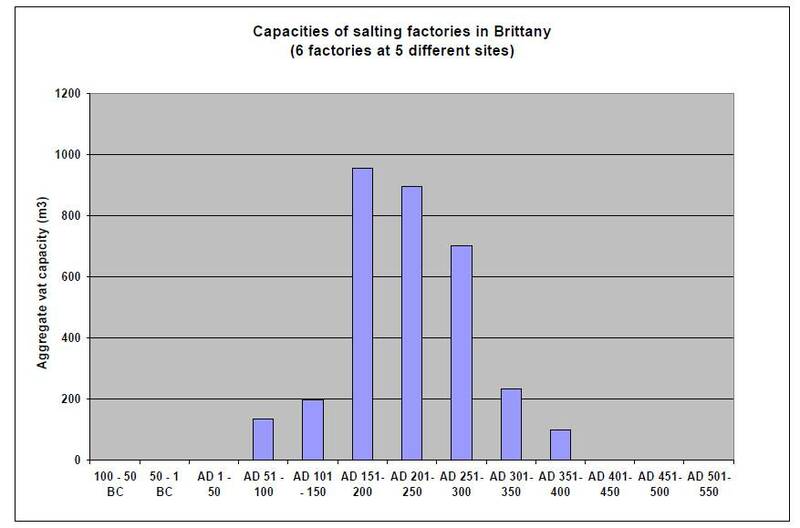 It is striking, and surely significant for understanding the economy of NW Gaul, that one of the largest salting factories currently known should be in Brittany. We need much better information on the capacities of fish processing installations. For many of the sites we lack basic information such as numbers and dimensions of vats; clearly many coastal sites have been partially destroyed or eroded, sometimes rendering this information impossible to obtain, but too many 'publications' simply lack such basic data, or fail to say whether depth measurements are complete or only to the height of the surviving walls. Capacity figures are the first step in gauging the significance of a site; but an analysis of how they change over time is necessary for a better understanding of the growth and contraction of the industry, in different regions and across the empire as a whole. Currently, however, the number of sites with published capacity information which can be pegged to dated phases is few. The graph below is a preliminary attempt to chart the total vat capacities for 34 different factories (at 22 sites) for which sufficient information on vat capacities and chronological phasing has been published to enable this. The sample is fairly small, but will be expanded. The phasing is crude, by half-century blocks, reflecting the level of precision in dating and in publications. The capacity figures should be treated as minimum estimates for many factories, as not all have been completely excavated and some are partially destroyed by coastal erosion. 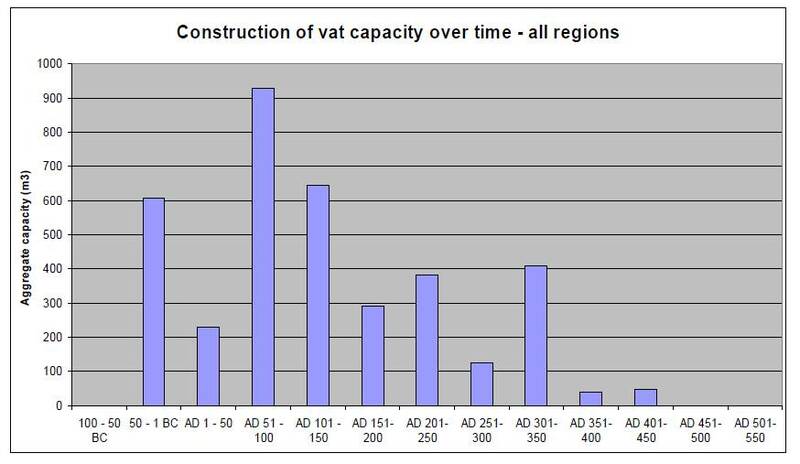 The graph of aggregate capacities for all regions shows considerable growth in total capacity in the first and second centuries A.D., with a sharp reduction in the third century, and a decline through the fourth and early fifth centuries to almost nothing in the later fifth century. While the overall graph perhaps shows an expected pattern, regional variations are apparent if the dataset is broken down by area. 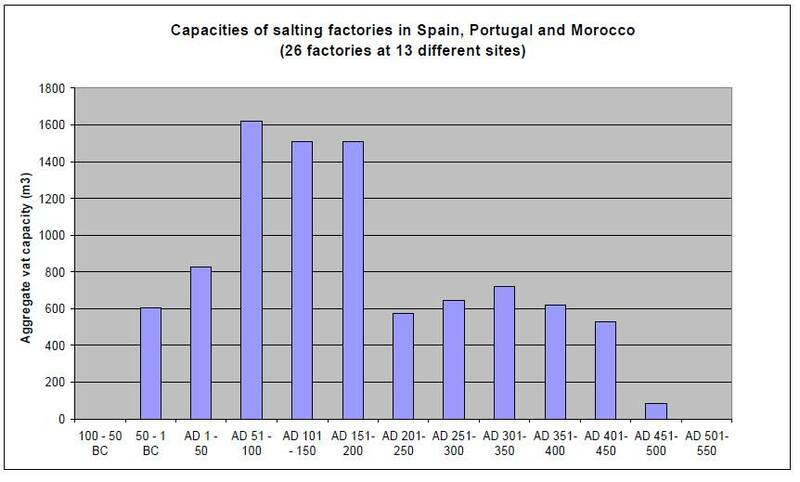 The factories along the Iberian and North African coasts around the Straits of Gibraltar show an earlier growth and a sharper fall at the end of the second century, but production in the third to early fifth centuries remains fairly stable at a lower level. Armorica (NW Brittany), however, shows a later onset and a sharper decline after the third-century; the small dataset for this region is dominated by the vast factories at Plomarc'h which were in use in the late second and early third centuries. It must be stressed, however, that quantification of vat capacities does not map neatly onto annual output of salted fish and derivative sauces. We do not know that all the vats were filled full, or what proportions of fish to salt (or brine) were used - although we might expect this to vary according to regional tradition and the kind of product aimed at. We do not know how many batches of fish were salted at any one factory each year, and we might also assume that this figure would vary regionally, or even factory by factory. Indeed, it is becoming clear that not every batch of product salted in such establishments was fish at all - in Brittany cow bones found in the bottom of salting vats at Kerobestin suggest salting of quarters of beef; abundant mammal bones (mainly sheep) were also found at Telgruc, but not in the base of the vats; and there is also evidence for the salting of beef and mutton at Douarnenez. Recent excavations at Iulia Traducta (Algeciras) indicate that when a salting factory there was abandoned in the early 6th c. AD, some of the vats were being used for salting joints of horse meat, beef and mutton. As the salting technology for meat and fish products was very similar, and the necessary salt was primarily available at coastal locations, it made sense to use the same infrastructure for both, and meat could have been salted outside the main fishing season. Salted meat was exported in some Punic amphorae, and may also have been carried in some Roman amphorae. Like salted fish, these could have been shipped dry, or in brine or olive oil (or even vinegar, in the case of meat), with the appropriate potential for confusion in residue studies aiming to identify contents from the presence or absence of pitch linings or traces of oil-related fatty acids. These graphs represent production capacity in use over time, and so should be a general reflection of production activity. 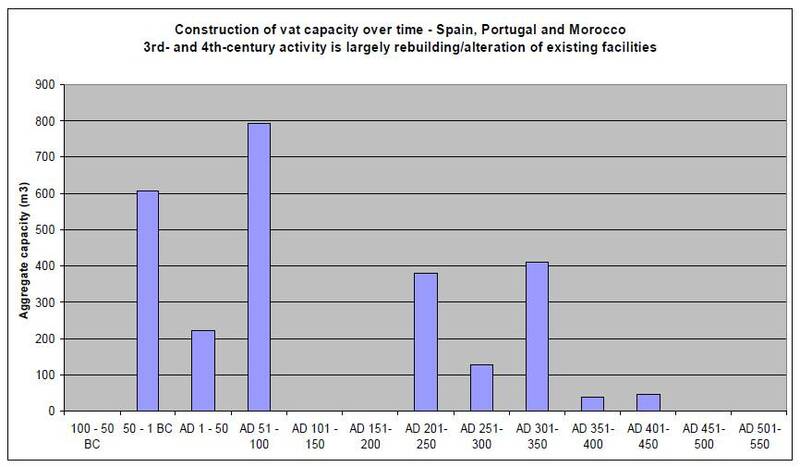 A slightly different picture emerges from the analysis of vat capacity by date of construction (or in some case, reconstruction). This reflects capital outlay to some extent, but not directly  while it would undoubtedly have cost more to build a factory with 300 m3 capacity than one with 150 m3 capacity, it is unlikely to have cost twice as much, as many facilities and parts of the structure would not have doubled in expense. Nevertheless, the graph gives some idea of periods at which investors judged it opportune to invest in construction or rebuilding plant. For all regions the graph shows peaks in the later first century BC and the later first and early second century AD ; the lower peaks in the third and fourth centuries relate chiefly to rebuilding of existing facilities. This is especially marked for the Straits of Gibraltar region. For Armorica, the picture is much simpler; investment begins in the late first century AD, with a major peak in the second century, due almost entirely to the construction of the large factory at Plomarch. No new facilities are built, or existing ones repaired, after the second century. Overall, the quantification of vat capacities by construction period shows some measure of the degree of investment in physical plant for the large-scale commercial salting of fish and of certain meat products for export. The quantification by usage period should give some reflection of trends in the production and export (as this was largely an export product) of salt fish and related sauces, and can thus be related to trade. This should also reflect salt fish consumption at a general level  thus enabling us to track the supply of an important source of protein, as fish could be shipped to inland communities only if it was salted. Moreover, it is also a reflection of salt consumption, and possibly an indirect indicator of salt production in the vicinity of factories, either by evaporation from salt pans, or lixiviation of salt-impregnated beach sands. These pages represent a preliminary analysis of the data on fish-salting vats; it is hoped to expand the dataset over the course of the project. The discussion here is based on : A. Wilson, 'Fishy business: Roman exploitation of marine resources', JRA 19.2 (2006). where full referencing can be found. Myrmekeion: J. M. Højte, 'The Archaeological evidence for fish processing in the Black Sea region', in Tønnes Bekker-Nielsen (ed.). Ancient Fishing And Fish Processing In The Black Sea Region (Aarhus University Press, Aarhus 2005). Lixus factory 3, Tahadart usines 1 and 4, Sania e Torres: M. Ponsich and M. Tarradell, Garum et industries antiques de salaison dans la Méditerranée occidentale (Paris 1965), 17-18, 43-48, 53, 55, 76-7. Cotta, Tróia (6 units at different times), Setubal, Quinta do Marim, Quinta do Lago, Sines, Creiro, Baelo Claudia (factories I, IV, V, VI, arrière boutique no. 23, decumanus, and other vats), Pesseguiro D14 and P16, Rosas : R. Étienne, Y. Makaroun, and F. Mayet, Un grand complexe industriel à Tróia (Portugal) (Paris 1994), especially 113-5. R. Étienne and F. Mayet, 'Cartographie critique des établissements de salaisons de poisson dans la péninsule Ibérique,' in É. Rieth (ed. ), Méditerranée antique. Pêche, navigation, commerce (Paris 1998) 33-60, at pp. 44-5, 48-9. Nieul-sur-Mer : Gallia (1977), 376. Douarnenez town, Plomarc'h 1 and 2, Kerlaz, Telgruc : R. Sanquer and P. Galliou, 'Garum, sel et salaisons en Armorique gallo-romaine,' Gallia 30 (1970) 199-223.